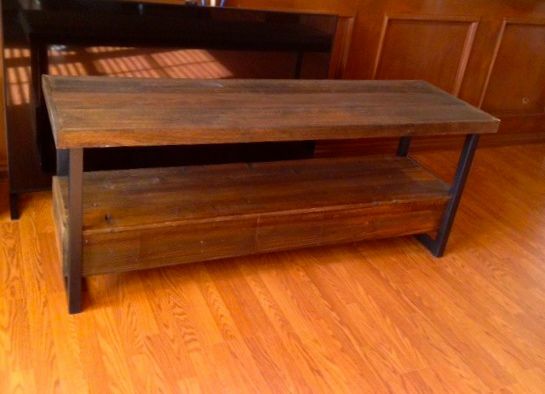 I have a potential client that wants a media stand with drawers made with reclaimed materials. Where I live there isn't much available in reclaimed material (broad category) but I have found a lot of 1" x 6" Redwood fence boards. My idea is to laminate them to Baltic Birch plywood, possibly mitering the edges to make it appear as a solid, thick board. Has anyone done that? My thought is to glue and brad them to the ply then sand and finish. My concern is this -- will they start cupping and does the bottom side of the ply need boards as well to equalize things? Just like veneering a substrate but with 1" materials instead of a veneer. If you have experience with this I'd appreciate your thoughts. Shouldn't be a problem as far as attaching the boards to a substrate, however I've not done it with boards that width or with redwood. We build restaurant tables with repurposed wood. These tables are reclaimed gymnasium flooring with 1 1/2" particle board substrate. They are 30" wide, a total of 2 1/2" thick and 18 feet long. Thanks Bill, appreciate your response and help. Now if the potential client just comes through with a deposit ……. ! If they are unfamiliar with the repurposed market, the sticker shock may take them out. Folks seem to think old wood is cheap wood. I agree Bill and with the current emphasis and popularity of the recycled stuff the folks that have it want a premium for it! This is a guy on Craigslist who says all boards are a dollar each so that's doable. John, You do know that solid wood shrinks and expands, right? So what moisture content are the fence boards? What happens to your glued and nailed assembly when the furnace starts running? Solid shrinks, plywood doesn't. Fence boards will split, you'll see the plywood between the boards, and it won't stay flat. It's going to be a mess. Bill, that is one of my major concerns too. I live in Las Vegas where humidity is generally in the single digits, winter time low teens. I've mentioned that to the client and he has a coffee table made in a similar fashion. I will probably rip the boards to narrower widths to hopefully counter the cupping concern. These boards are bone dry, usually if something built here stays here humidity changes aren't too much of an issue. Currently working on an Armoire of genuine Mahogany, the wood has been resawn and stickered (8/4) for a few days with no change in them. Appreciate your input, still waiting for the client to okay the job. Have a Happy Thanksgiving! Gluing and brad nailing seems unnecessary and troublesome to me. Why wouldn't you simply build the drawer box and then apply a drawer face of redwood? Attach in such a way that it floats for movement and adjustment. If you want to get crazy, I have had success making panels of a lattice construction, two courses 1/2" thick, with 3/32" gaps between the edges, stapled and glued at each intersection. That's what the doors are on the fir coffee table recently posted here. I build with a lot of reclaimed fir in seattle, and the incredible stability of old fir may let me get away with too much cheating the rules of wood movement, but I always kind of considered them more guidelines. I hope that's some pretty nice redwood if it's ten bucks a board foot. Also, I like the green tables, but with our general love of pointing out unbalanced panel construction, I am surprised no one has told bill he can't build them that way. I had a teacher who taught me that you can get away with cheating wood movement only as long as you don't know any better, and then it will stop working for you. Thanks for all of your input, I bought a couple of the boards ($5.00 each) and made a Nativity Scene as well as these samples. They are bone dry so will run them through the planer to flatten one side which will be glued and brad nailed to shop Maple ply; edged to give it thickness. Drawer unit on bottom same treatment but basically drawer boxes with the boards screwed to them to allow for any adjustments needed. Most definitely tell the client that wood can move and things may change -- he likes the look of the images attached which were simply wire brushed and top coated with varnish. I like your outlook Jesse on the wood movement, I suppose that ignorance is bliss! That is some nice redwood. Flatsawn, tight grain. That's what some of the best old fir I've seen is cut like, too; you probably couldn't get it new at any price. It's a vg world for old-growth softwoods now. Jessie, I wanted to ask you about your comments. The tables I posted were tongue and groove flooring attached to substrate in the same manner as general flooring. I recognize there will still be some movement even though the material is over 50 years old. How, then, should I have configured those tables? I went to a local college with a great woodworking program, loved it, and have been building furniture and casework for about four years. I'm a pretty crafty fellow, come from a long line of engineers, and have some good design sense. But I'm not even close to telling older or at least more experienced cabinetmakers how they ought to build. I was just poking a little fun at how often we woodwebbers tell each other what will and will not work. I think the tables are awesome, and they look well-made. They are more balanced than a lot of panels that also "work" even if they "shouldn't". I think if you laid up that flooring on a 3/4" substrate it would probably have some problems. But maybe not. 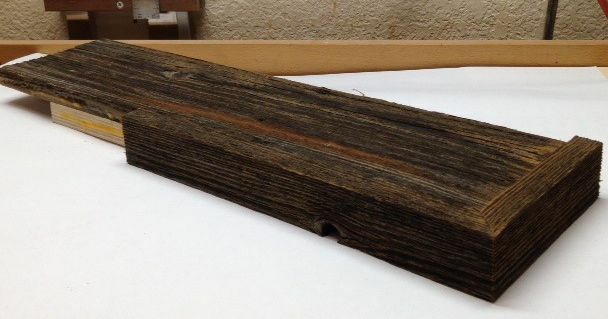 As an aside, I often hear the idea that old wood won't move, and I don't find that to be true. 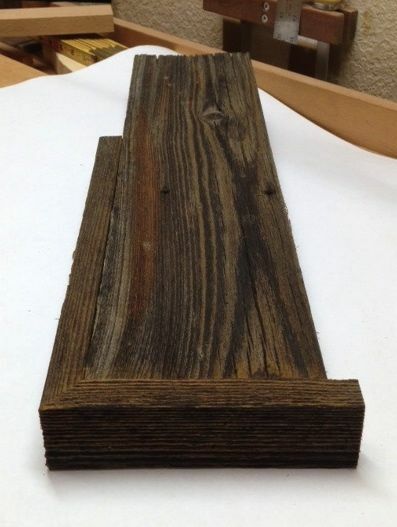 I think often old wood is just stable wood in the first place, and stays stable in old age, as we all hope to. I appreciate your comments. I'm always looking to learn, and try to better myself on every project. I agree with ongoing wood movement for the most part. If the old wood is not substantially altered, in my experience it remains pretty stable. If milled heavily, it reverts back to a new wood behavior. The only thing I'd plan on doing is to remove about 1/16" from one side to give a bit of flatness and a better glue surface. Client's being kind of problematic so time will tell!